The state of Gujarat in western India advocates a meat free diet. This dietary recommendation dates back two millennia, when the slaughter of animals was banned in the name of peace. Mahatma Ghandi, a great promotor of a strictly vegetarian diet is Gujarat’s most famous son. Some wonderfully creative recipes have come from two thousand years of inventive cooking with vegetables and pulses so I wasn’t surprised to learn the origins of this kofta dish. Besan is flour made from chick peas. It’s rich in protein and has a delicious nutty flavour. It also has amazing binding quantities so a small amount is all that’s need to hold the finely chopped spinach together to create a surprising light but meaty quality. The spinach will absorb a large amount of flavour so don’t stint on the seasonings. Serve the spinach kofta in their tomato gravy topped with a dollop of natural yoghurt. Wash the spinach the drain in a colander. With water still clinging to their leaves, put the spinach in a large over a high heat. Cover tightly and cook until the spinach wilts. This will happen quickly so keep an eye on the spinach. Turn the mass of leaves over with tongs to hasten the process. Drain, then refresh the spinach in iced water. Squeeze handfuls of the spinach tightly to remove as much water as possible. In the food processor, pulse the spinach until roughly chopped. Roll the spinach mixture into small ball about 3cm in diameter. In a small non stick pan, heat about 1 cup of vegetable oil. When the oil reaches 180C, drop in a few kofta at a time and fry until golden. Heat the garlic oil in a wide shallow pan. Add the cumin seeds and toast until golden. Add the remainder of the ingredients, stir well then bring the pan to the boil. Reduce the heat and simmer until the tomatoes collapse and you have a rich tomato sauce. Check the sauce for seasoning, then tip the kofta into the sauce and simmer gently for a further 5 minutes to warm the kofta through. * you can use plain vegetable oil or ghee and add 2 crushed cloves of garlic with the tomatoes if you prefer. I tried the recipe and it’s as delicious as it sounds, thank you very much for sharing! I think that’s my favourite one so far – just looks so delicious! This looks great! I happen to have the spinach in my refrigerator and all other ingredients in my pantry, so I may make these tonight! I wonder if refreshing the spinach is really necessary? 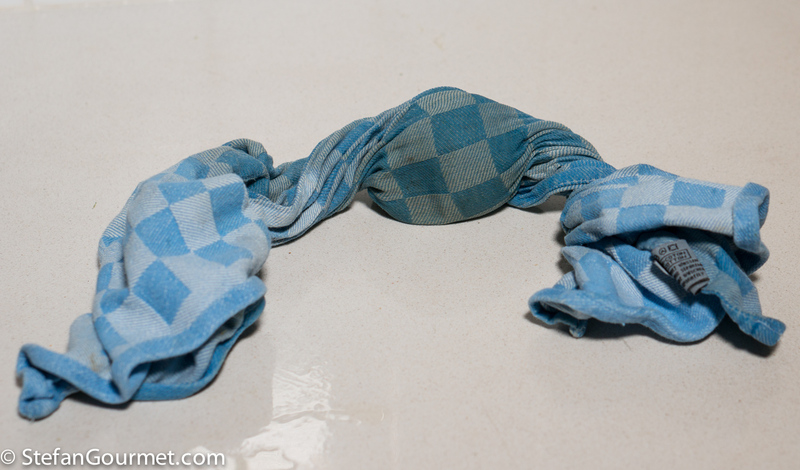 I use an old tea towel, which works very well. Made this tonight and was delicious. But there is something wrong with the amount of salt. For the koftah I did use a teaspoon as per the recipe, but next time I’ll use less. 2 teaspoons in the tomato gravy is way too much; I used 1/4 teaspoon instead. This surprises me, as you usually use very little salt in the recipes you post. I think you’ll find it’s the difference in salt. I always use Australian mineral rich sea salt flakes. I have noticed that “cooking salt” is much saltier. It’s wise to let your palate make the decision when it comes to seasoning. It’s the texture of the salt. A teaspoon of flakes weighs less than a teaspoon of fine salt. If you have precision scales, I’d be interested to know how many grams of your salt there are in a teaspoon. OK. 1 teaspoon Murray River Salt Flakes = 3g. When I’m baking bread I always weigh everything. Bread using regular cooking salt is much saltier than bread with an equal weight of the above salt flakes, so while weight is unquestionably a factor the mineral composition plays a big part too. PS I also used fresh tomatoes and they vary so much in flavour of course altering the amount of salt needed. I used canned tomatoes and added a pinch of sugar after tasting. I am so into anything with tomato gravy! Please do! One of the best kofta curries I have seen! Another fabulous veggie curry for teh collection. Love the sound of these koftas. Thanks Francesca, they were delicious. I think this might be a good one to make with the grandkids. 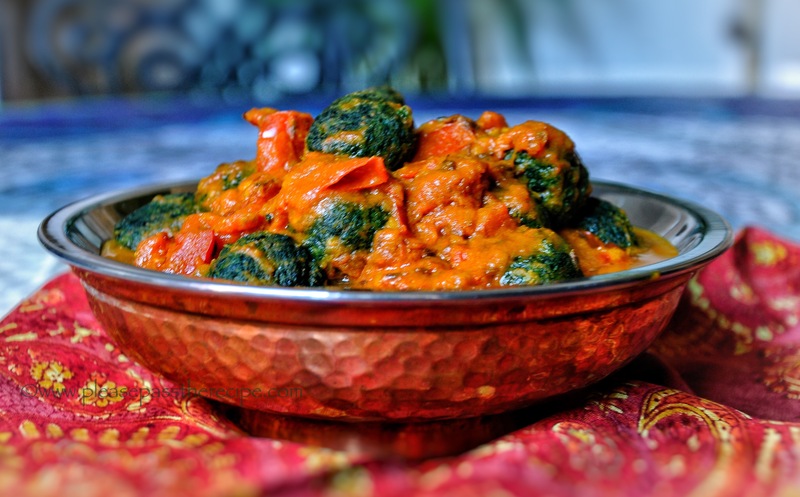 Squishing spinach to shape is a fun job..
great idea spinach kofta , looks delicious! Veggie koftas. Be still my beating heart, we always order them but I have never made them. This is a call to arms Sandra. The Yak and I have a table booked at an Indian restaurant this Saturday night for our wedding anniversary that specialises in dosai. It is certainly all about Indian food at the moment, I can’t wait to make this. Delightful Sandra. I am really enjoying this series. It lightens my commute. Thanks Conor it’s been a delicious month for me.. This entry was posted on March 28, 2017 by ladyredspecs in Cooking, Dairy Free, FODMAP diet, Food, Gluten Free, Indian Food, Lactose Free, Light Savoury Dishes, Main Meals, recipes, Side Dishes & Salads, Vegan, Vegetarian and tagged Fodmap, gluten free, indian, spinach, spinach kofta, tomato gravy, vegan, vegetarian.